Most of you would know that earlier this year, I wrote – and published – a book. This is my very first. I made a plan to write about this, but I can never think of a great first sentence. If there’s anything I learned from studying journalism in school, it’s that leads are important. And man, am I sucking at that or what? But the point is: I wrote a book. Actually, I used to say, I wrote a story. I used to go around and ask people (friends more likely), “Can you read my story?” My friends are really nice and they do read my stuff, even if I write really long stories (but not Gone with the Wind long, this is still under 50,000 words and is considered a novella). But now that I’ve published it, with a cover and all, and it’s in a store – I guess that makes it real. I actually finished writing this back in 2009, but I’ve rewritten it in major ways this year. Some names have changed, some scenes were added (as new people), and some scenes were deleted. Some people ask me why I waited five years (well, it’s really because I didn’t know how to self-publish then haha) but I think I needed those last five years to step back from my very first output, be less subjective, be more equipped with the feels (lol) by reading more works from great authors, and get this ready. I had about a dozen edits for this book this year alone (I even have an alternate ending…who wants to see that? lol) because I could really be neurotic at times, but I can honestly say that I’ve put my pencils up for this one. It is done. 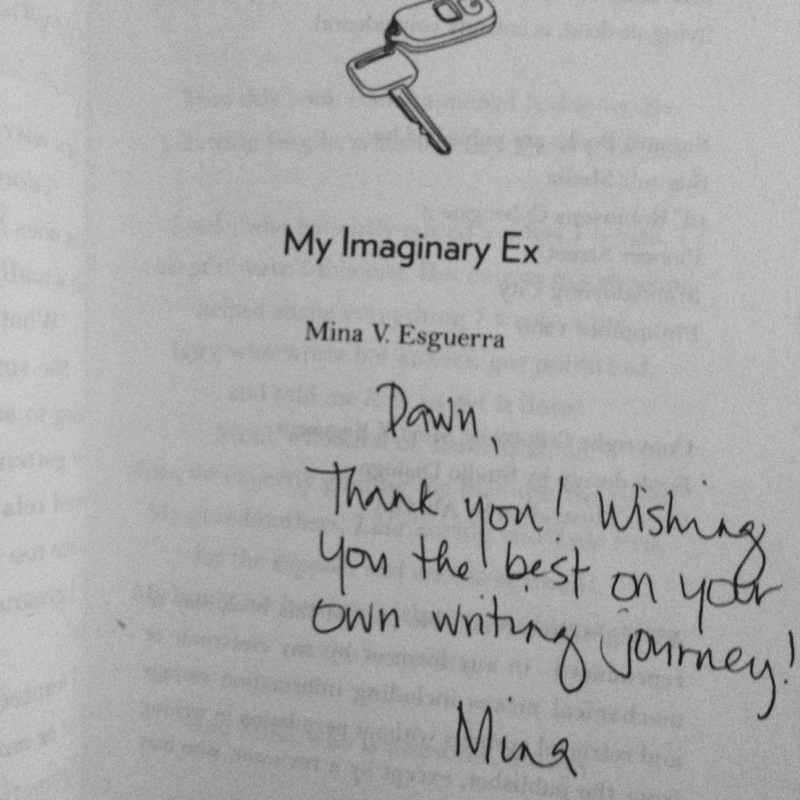 Mina V. Esguerra – I read My Imaginary Ex the year I wrote the first draft of this book, so I don’t know, I think in some way, she acted as a catalyst for my writing. And the fact that I met her this year to learn about Self-Publishing…it kind of makes the whole thing come to full circle. And also, Michael A.R. Co, cause that workshop’s really helpful and awesome. Plus, I got to her to sign my copy of My Imaginary Ex, an 2009 me is pretty much #winning. My friend, Ica – Ica is a member of the literary organization I joined back in UP, Pantas. We’ve grown quite close after school and she was one of the first people I approached to read my manuscript. I love that she may be the first person to ever get giddy over my fictional characters. She also mentioned a couple of things that I think really helped a lot with my book – and with my protagonist (I took up that note about having her more involved with work than her personal stuff haha). My friend, Maan – I had Maan read my manuscript cause 1) I tell her almost everything anyway lol and 2) She’s the perfect rep for my target audience. I presented her with the alternate ending first (which was really the original ending, it’s not sad but not so happy either, just meh), then sent her another ending (the sadder one that made me cry when I was writing it), and bless her heart, she kept reading draft after draft. I think we started getting confused with the drafts too but I wasn’t happy with the non-happy endings, and neither was she, so one day, I just let the happy ending happen. And I was happy with that. (I slept well after that too). Maan cried. Or had ~some tears. Or just maybe had feels. And that was a better reaction, and I wanted to have my readers react the same way, as much as possible. My friend, Ilia – Ilia is the last person I asked to read my manuscript. She’s like the ultimate judge. She pointed out that the women in my story didn’t have much weight on the first draft so I took that up cause we’re all for girl power! She also likes Dirk the most, who is kind of my favorite ex. Just cause he’s such a person, you know? Like come on, we all know that guy. My childhood friend, Tim – TJ (I still call him TJ though) and I met in grade school. He was drawing comics and we were making its stories up with our friends with him then (In fact, I was assigned to a character in that comic – Em Langley represeeent! – God, we need to make those comics again haha). Grade school was a pretty awesome time but he switched schools in high school. 😦 The good thing about social media is that friends can remain friends, and luckily, TJ is still making art so when I needed one for my book cover, who did I call? (Ghostbusters!) No, TJ! Honestly, I could still use a better perspective when it comes to book covers (I wish someone could just think of it for me! I’m too attached lol), but TJ did a pretty cool illustration for Regina. My editor, Whoopi who took on a romance novel even if she’s not really that much of a romance reader. And she liked it! Yay! My sister, who questioned my book’s premise and made me dig deeper (she does that a lot anyway, she questions a lot of things in my life haha). My mom, who actually has no idea what my book is about (I think? ), but she cheers every time I tell her I get a good review or something. Dianne from Oops I Read A Book Again! for organizing a blog tour and for answering my first-timer questions! Also for being a Twitter friend. To the bloggers who read and wrote a review for my book, thank you thank you thank you. To be honest, every time I read a book, I’m always looking for people to fan girl with or something, so reading some of your reviews provided me with that. To The Pixies, who wrote a song that basically made me think of the scenario: hey, what if this song was playing and this really gorge guy walks in and we look at each other and somehow, I just know? Here comes my man. The song isn’t really about that, but well, JOSEPH GORDON-LEVITT MADE ME THINK ABOUT IT. Also, to Meg Cabot, who was really maybe the first author I went gaga for. I was 14, and I bought The Princess Diaries, and I’m like OH YES I’M GONNA READ THIS OVER AND OVER AND SHOW THIS AROUND TO MY FRIENDS. And also, okay, to all the boys I knew (and just stalked *coughs celebrity names*) that maybe had bits of themselves in my characters. Not Taylor Swift-ing you. But as far as dedications go, is it selfish to want to dedicate this (not just the book, but the whole act of producing one) to me? Not me now, but to 14-year-old me. I kept reading this quote, “Be the person you needed to be when you were younger.” (Ayesha A. Siddiqi). I think that’s somewhat embedded in me now. And when I think about this, I figure, well, that ain’t so bad. I think I just made young me proud. I think I made young me’s day. She was always daydreaming anyway. 1. Get the manuscript re-edited before I attend that other workshop/seminar for print. 2. Write next story before I get lazy or crazy. To read the first few chapters, go to Wattpad. Read reviews, blurb, go to Goodreads. Buy the book? Why thank you, kind sir (madame?). Go to Amazon.